I'd like to dedicate these EZ Sunday photos to Deb Barnes, who wrote a Facebook post about sweet Mia resting on her freshly washed clothes. Any cat who doesn't lay on clothes fresh from the dryer should be stripped of their catliness. MOL! First I'll lay on TW freshly-washed (and colorful) unmentionables. Then I'll finish my nap on Pop's folded t-shirts. TW wanted me to tell you the Gut Rot from my last blog was actually "good for me" Soulistic grain-free Autumn Bounty (human-grade chicken in pumpkin soup). Soulistic, which is made by Weruva, is only available at Petco. Sometimes I'll think it's nommy and sometimes I turn my nose up at it. She didn't want you to think she was feeding me real Gut Rot. We're coming down to the last few days to get in on this special offer. Just4MyPets has a special offer for readers of Stunning Keisha. Use the special coupon code KEISHA20OFF and get 20% off your first order. This offer is valid through June 3nd. Two paws up for furring up the unmentionables! Our Mommy says there is nothing worse than a cat hair sticking you in the arse through your undies! Bwahahahaha! I am gypped out of furring up clean clothes - when they come out of the dryer, my human hangs and folds them immediately! I don't even get a chance to sniff them! We don't have dryers here simply because we have sun all year round. And mean Mommy leaves the dry clothes hanging on the rack until she wants to fold them. So we have NO opportunity to fur any of the clean laundry. NO FAIR! Audrey furs up Mom's pillow so it makes Mom's nose tickle at night! We do like laundry too, but don't get a lot of chance at it. Our pawrents tend to hang a lot right out of the dryer. No fair! Wish I could lie on nice fresh warm laundry. Sounds good to me Keisha. Have a serene Sunday and good luck with the gut rot LOL. Newton especially loves to leave lots of fur on warm-from-the-dryer unmentionables. Ashton is too afraid of peeps carrying the laundry basket to have figured out how wonderful warm laundry is. Is there a clause for former ferals that lets them keep their cat card if they are too afraid to try the warm laundry? Mario's mom here - you are so right. Every cat I've ever had laid on the fresh clothes - unless they are hung up immediately (if not sooner). 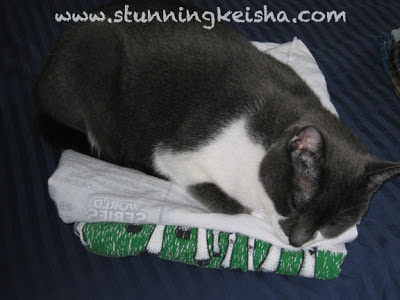 Don't think I've ever seen you as serene as that photo of you napping on pop's shirts...Love it! ewwwww. TW's unmentionables. I hope you left lots of gray fur so she will think, hmm is that mine? I am very grateful that my human is exceedingly lazy when it comes to laundry. Not only does it take her forever to fold it for the drawers or to hang it up in the closest, but she immediately uses the excuse that she does not want to disturb me when I am instantly napping on it, allowing further procrastination. She wears my cat fur proudly and we are a good team like that! Purrs from Mia! I'll have to try napping on fresh, warm laundry. The Hotties love it too. That might be a cat thing, but I kinda like the fresh scent myself! woo woo! There is nothing quite like clean crisp white laundry with a layer of black furs on top! I never shed my white ones unless the laundry is black I am thoughtful like that! Count me in CK, we are all clothes pressers here! CK, you're totally right about laying on clothes just out of the dryer. But do you know we rarely get the chance to do it? The mom is too darn quick about putting stuff away. We like that Soulistic stuff...we didn't know it was made by Weruva. Yesterday was laundry day at the Townhouse too! Waffles has NOT learned the finer points yet. He seems to prefer knocking over stacks of neatly folded t-shirts a opposed to napping on top of them. Rookie mistake. Well gut rot is gut rot. I've had my fair share of it around here too. Aw yes, the beloved fresh from the dryer laundry. We like the dark clothes the best! What about you? If we do a good enough job of distributing our furs, we get a steady stream of this warm stuff. Wash, dry, let kitty curl up and nap, wash, dry, repeat, over and over again. Almost the bestest fun we kitties can have. MOL. Purrs and hugs from the kitties at The Cat on My Head, Lily Olivia, Misty May, Mauricio, Giulietta, Fiona, Astrid, Lisbeth and Calista Josette. IF YOU TRIED TO COMMENT ON OUR POST "PAYBACK FOILDED" AND COULDN'T DUE TO THE CAPTCHA CODE, MOM HAS REMOVED THE CAPTCHA REQUIREMENT! SHE'S ALSO NOW REMOVED THE CHECK BOX 'CAUSE IT NEVER APPEARED BUT YOU STILL COULDN'T COMMENT. I couldn't agree with you more regarding fresh from the dryer! Anyway, the humans have it fresh from the dryer for us, don't they? CK, you are so right. Warm clothes, fresh from the dryer ... heavenly! 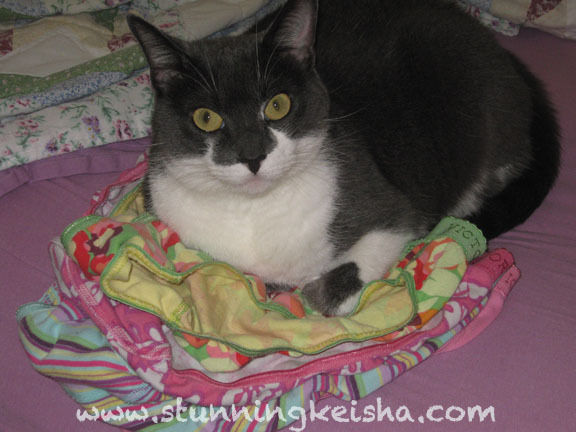 Brulee likes to "dig into" the fresh pile of Mom Paula's clothes from the dryer. Way to fur up the fresh clothes there, my dear! You look so adorables on them! There is nothing like clean folded laundry !